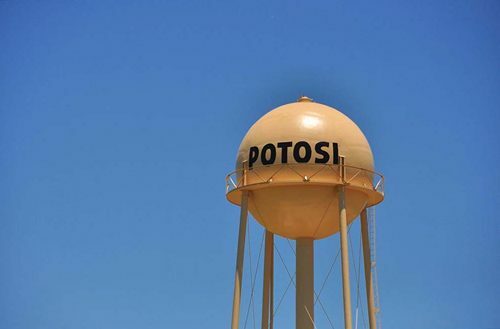 The Taylor County community of Potosi is not big enough to have a whole lot of stories connected to it, but there are a couple. First, a little background: Potosi is nine miles southeast of Abilene. Unlike many small towns, given its proximity to the capital city of the Big Country, it has actually grown in recent years. In the 1920s, however, it was down to only 20 or so residents and well on its way to being a ghost town. Today, more than 3,000 folks call it home. The community proper dates to 1880, when folks in that part of the county built a Methodist Church. Though the church burned down four years later, it was rebuilt and in 1897 a one-room school house went up. But settlement in the area goes back to 1870, when one John Lytle had the distinction of being the first known resident of the area that would come to be called Potosi. The first story involves Lytle. Why Potosi is Potosi is the second story. A young man originally from Tennessee, Lytle lived in a dugout near a spring. He made his living rounding up wild horses and selling them. He did pretty well for himself. There being no banks around, or any other businesses for that matter, he safeguarded his money himself. Most of that money, the story goes, was gold. Four years after digging his dugout, a sweep of hostile Indians through the area made it expedient for him to travel elsewhere-in a hurry. He buried his money and rode toward Austin. Stopping somewhere near Austin, the place isn't specified, he took sick. He sent word to his family back in Tennessee that, as the saying went, he was in a "dying condition." A relative made it to Texas, but by the time he arrived, Lytle had grown too ill to talk. Because of that, no one ever knew where he had established his "bank." Lytle was buried, and his accumulated worth likewise stayed buried somewhere around his old dugout. The Red River War of 1874-1875 effectively ended the Indian threat to West Texas. Sporadic raids continued a couple of years longer, but for the most part, the country was safe to settle. Others moved to what would become Taylor County, then still an unorganized part of Eastland County. One of those arrivals was Bob Barker. One day a man Barker had hired to do some grubbing for him arrived carrying an old iron kettle. He said he was leaving. "Wait for Mr. Barker to return to pay your wages," Mrs. Barker said. The hired man hefted the kettle. "I don't need it," he said. And left, presumably with Lytle's gold. In addition to a classic treasure story, Lytle left behind his name. There's Lytle Cove, Lyle Creek, Lytle Gap and Lytle Lake. The settlement that developed in the area also became known as Lytle. By 1893, Lytle had a general store and a cotton gin. Bob Pollard, the man who owned the store, figured an up and coming place like Lytle needed a post office, too. When he applied for a permit, however, Washington rejected it because there was another Lytle somewhere. Pollard flipped through the first book he could find looking for a more suitable name. What he came up with was Potosi, inspired by the Mexican city of San Luis de Potosi. West Texans, of course, don't pronounce it the same way they do in Mexico. In Taylor County, the community is known as PA TOE SEE. However its pronounced, Potosi by the beginning of the 20th century had more than 100 residents. A Baptist church complimented the Methodist church and in addition to the general store, there was a dry goods store, a couple of blacksmith shops, and a cotton gin. Potosi still has a store and a grill, but if you need a place to keep your money, you'll have to do your banking in Abilene. Or bury it like Lytle supposedly did.